Disclosure: This post contains affiliate links. Please read my disclosure policy for more information. This post is not sponsored by any of the companies or programs discussed. I am using these companies as an example of how you can get started and go deeper with an affiliate program. 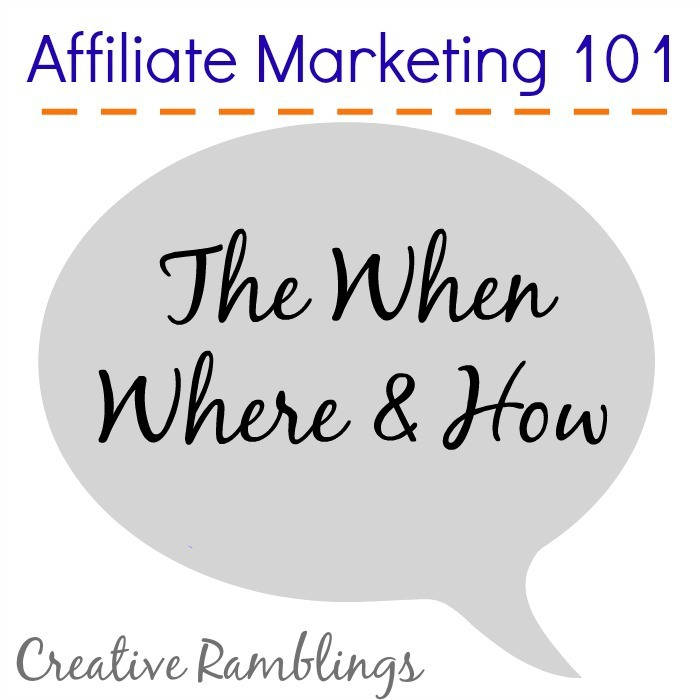 A couple of weeks ago I shared with you Affiliate Marketing 101 – The Basics. I explained what affiliate marketing is and how to get started. Take a look and see how you can get started monetizing your blog, then come back here for more details. How and when to use affiliate ads? So you’ve found a program you like and you’ve signed up. Now what. Programs like Share-and-Sale and Amazon have all the tools you need to promote them (banner, text links, social media ads etc). What you do with them is up to you. Your readers come to you to read, learn, and engage with your community. If you packed your side bar with ads, included a banner in your emails, posted daily deals on facebook, and used text links in every post you may scare off some of your audience. You would also dilute your content that you have worked so hard to create. The key to successful affiliate marketing is to work the ads into your existing framework. Social Media Posts: When I see a great deal I like to share it with my readers. The most effective way to do that is through social media. I try to share 1 a week, maybe 2 if something is just a phenomenal deal, but 1 is typically my limit. I find Facebook and Twitter to be the most efficient forms of social media marketing. With Amazon there is a toolbar at the top of the site when I am logged in. From here I can share a product directly to my Facebook account. 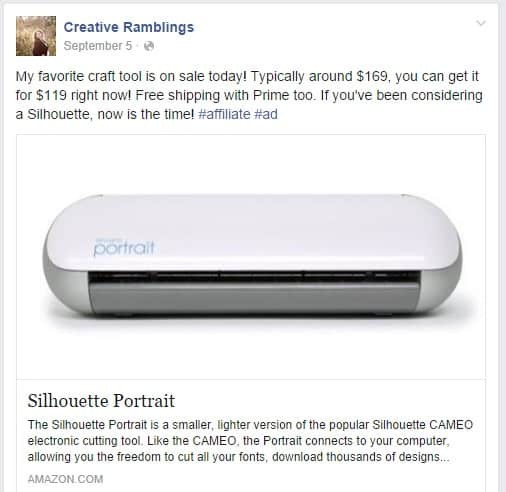 This post had quite a few click throughs to the product and sold 1 Portrait (the product I was promoting) and a few other items. Supply Lists When I am doing a tutorial I will list my supplies. Realistically I could buy almost everything I use on Amazon, but I don’t. I shop locally and often times have product on hand. When I create supply lists I will link 1 or 2 items back to Amazon. Typically these are items I purchased there in the first place. Or items I know are a great deal there. Below is a simple post using 2 items. The paper I bought locally and the chalk marker I purchased on Amazon. It is something I use and talk about it often. Every time I link to it I sell a couple. It’s easy to sell an affiliate product when you talk about it naturally and truly like and use the product. Sidebar Currently I have 2 affiliate sidebar ads. The first is for Pick Your Plum. They are a daily deal site that I refer to often and love their products. The other is for my hosting company ipage. Via Share-a-Sale I have the ability to show ads from any company I choose. I show these 2 ads because they are companies I love and want my readers to know about, they also pay a nice commission. Make sure you have a balance and don’t overwhelm your readers. Too many ads and your readers will ignore them all. astore Take a look at my menu bar. “Shop my Favorite Supplies” takes you to my atore. This is a store I built through Amazon and embedded on my site. I can add any product Amazon carries to this store. I choose to highlight products I use and talk about in my posts. Most of the products in my astore I have purchased on Amazon. The benefit of the astore is that the customer does not have to leave my site to make a purchase. Amazon has recently launched Publisher Studio. I am in the process of setting this up on my site and promise I will post a tutorial as soon as it’s up and running. 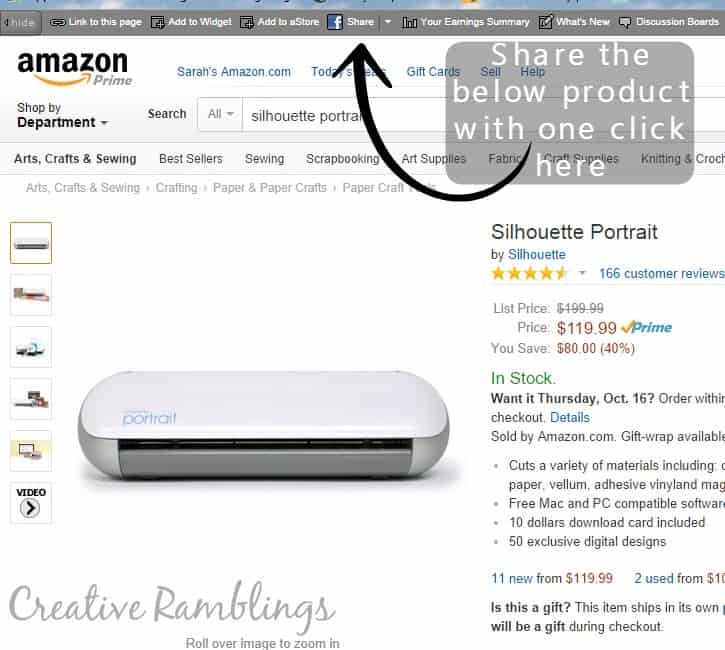 This allows you to link an Amazon product to your image letting a customer purchase right from your site. I have seen it in action of a few other blogs and love the look and feel of it. I hope this has helped you learn a little more about affiliate marketing. I’d love to hear how you put it to use! I hope you take the leap, once you get started you’ll be fine 🙂 Thanks for stopping by and reading.